I was listening to something on the news and realised that we use completely different, and often negative, language when we talk about illnesses that affect our brains. The very word mental has very negative connotations yet illnesses like depression are just as life changing and life threatening as cancer, an illness which suffered the same sort of stigma years ago but which is now widely talked about. 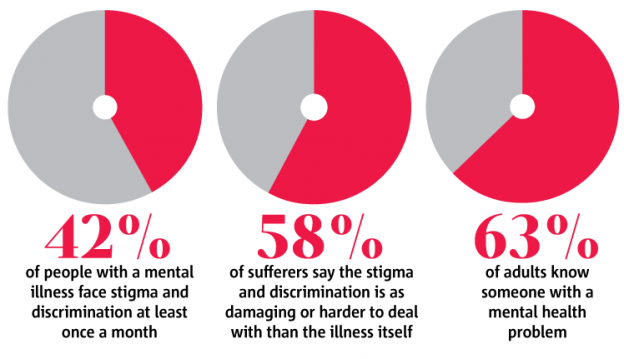 Ironically the chances of suffering from either type of illness are roughly the same, 1 in 3. Any one of us can be affected at any time. I was pleased to see the government have now introduced targets for the NHS on waiting times for mental illness to match those on physical illnesses but I am filled with despair that we still, as a society, differentiate them as we do. An illness is an illness regardless of which part of the body it affects. In referring to mental illness as something different, especially with the negative connotations of the word mental, we do people who are affected by these illnesses a disservice. Some would say that illnesses of the brain affect the very core of who we are, changing our behaviour, diminishing our ability to make decisions and that is undoubtedly true sometimes, perhaps that is the scary bit for most people because it could be seen as losing the control a lot of people value highly. Some of the people I love most in the world have been affected by these illnesses, either as sufferers or as supporters and I have found one of the most useful ways of dealing with it is to separate the behaviour led by the illness from the person you love. In the same way that you would accept someone who struggles to walk could not climb a mountain with you, you need to accept sometimes that someone with depression literally cannot go out for a meal with you. It doesn’t change the fact that you love them or that they love you, it is just a fact at that time with that illness. Undoubtedly one of the hardest things to deal with though is the worry of how people will react. Thankfully we have a strong family and friends network who have supported us and got us through but we have also had people’s behaviour towards us change, people we thought were good friends have struggled to cope with and understand the illness and it’s consequences. They have been unable to adjust and understand and that’s a real shame. So please if you are interacting with someone affected by one of these illnesses choose your words wisely, be kind and remember the wonderful properties of a cup of tea and a hug. They really can work wonders.